It would come as no suprise to anyone who knew me to disscover that adore cherry blossom trees. They're pink, dainty, feminine and did I mention pink?! But their appearance isn't the only thing I'm fond of. 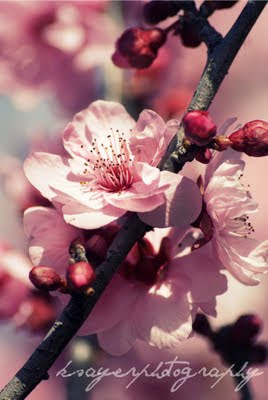 Cherry blossoms are the symbol of Spring and each year when the trees bloom around my house, I know Spring is coming. The dread of Winter is finally easing, while the temperatures may not be as high as I'd like and rain still streams from the sky every now and again, most days are filled with bright blue skies and sunshine. But until that warmer weather hits and Winter is over, I'll just enjoy the pretty pink Cherry Blossoms. Are there any particular flowers that you connect with a particular season/time? I can feel the same change in the air! Prettiest pic of cherry blossoms. I don't have a flower as such, but I love the feeling of that first bite of sun on your skin when you know summer is on its way. Ohhh, I have to agree, that is THE BEST feeling! Especially on days where it's still just a little bit chilly, it always puts me in a good mood. Thanks Lisa! I agree, wattle trees are definitely vibrant! Oh no! Hopefully winter isn't too dreary for you!